January | 2015 | Larry Montz and Larry & Daena DO VEGAS! COOL GUESTS on LARRY & DAENA DO VEGAS! in February 2015! Larry Montz the human and Larry Montz the robot at the 2015 International CES Show in Las Vegas! Larry & Daena DO VEGAS!, produced by VegasRadio.Today for HealthyLife.net, has an exciting line-up of cool guests for the month of February 2015. For the first Thursday, February 5th, Larry Montz and Daena Smoller welcome Wedding Officiant JANET LAWRENCE of DISTINCTIVE CELEBRATIONS, LLC. Ms. Lawrence, a former model and owner of her own talent & modeling agency is now busy serving Henderson and all of Las Vegas in custom-created wedding ceremonies and receptions. How perfect to speak about weddings in the love-struck month of February! On February 12th, Larry Montz and Daena Smoller travel a little south on old Las Vegas Boulevard, down to Jean, Nevada for a LIVE REMOTE of Larry & Daena DO VEGAS! at the GOLD STRIKE Hotel & Gambling Hall. Stop in between 2p – 3p PT that Thursday during the Remote, play a little ‘5 RANDOM THINGS ABOUT VEGAS YOU MAY NOT KNOW‘ to WIN COOL PRIZES! Win Prizes during the Larry & Daena DO VEGAS! remote at the GOLD STRIKE Hotel & Gambling Hall in Jean! Larry Montz, co-host of the Larry & Daena DO VEGAS! talk show, covered the 2015 International CES Show in Las Vegas in January and his interviews of innovative products of the future for today, ran for weeks on HealthyLife.net News @ 7 (weekdays at 7am and 7pm on HealthyLife.net). Way too many fabulous interviews for just one Larry & Daena DO VEGAS! show, these not-to-be-missed interviews fill up three shows and the initial installment enjoys a first-run on Thursday, February 19th! Larry Montz interviews creators and innovators of your future! For February 26th, Larry Montz and Daena Smoller present a special interview jam-packed with fabulous stories about Las Vegas, with Executive Director of the historic Railroad Pass Hotel & Casino, Curt Thompson…. including stories about ELVIS’ early days in Vegas, the Rat Pack and what actually happened to the audience during an original performance by Vegas entertainment legends, Siegfried & Roy! VegasRadio.Today is now on Facebook! Please give it a “LIKE” and share it with your friends. Larry & Daena DO VEGAS! is produced by VegasRadio.Today for HealthyLife.net and 60 syndicated distribution platforms. After each first-run show date, each episode of Larry & Daena DO VEGAS! is available for a 13-week, 24/7 ON DEMAND run on HealthyLife.net – All Positive Web Talk Radio. 5 RANDOM THINGS ABOUT VEGAS YOU MAY NOT KNOW, a new feature of the Larry & Daena DO VEGAS! talk show, is presented throughout the month of February by the RAILROAD PASS HOTEL & CASINO at 2800 Boulder Highway in Henderson. Featured guests of Larry & Daena DO VEGAS! get to participate in the fun each week! And, after each show, the questions are posted to the new VEGAS TRIVIA page on VegasRadio.Today, also sponsored by RAILROAD PASS HOTEL & CASINO. Each set of 5 questions pertaining to 5 random ‘things’ for the week, provides which Larry & Daena DO VEGAS! show (ON DEMAND at HealthyLife.net) will reveal the answers. Larry & Daena DO VEGAS! talk show, produced by VegasRadio.Today for HealthyLife.net and 60 syndicated distribution platforms, is LIVE Thursdays, 2pm – 3pm PST, from ASTON MonteLago Village Resort at Lake Las Vegas and sponsored by the GOLD STRIKE Hotel & Gambling Hall in Jean, Nevada… conveniently located between Primm and Las Vegas. This amazing oasis in the desert is where Vintage Las Vegas good times roll including LIVE MUSICAL ENTERTAINMENT Friday and Saturday nights and on Sundays, prizes go to the best amateur singers in an interactive musical event hosted by Las Vegas mainstay entertainer, Lary Glen Anderson. The GOLD STRIKE HOTEL & GAMBLING HALL is just 20 minutes south of Mandalay Bay on THE STRIP. VegasRadio.Today produces the Larry & Daena DO VEGAS! Talk Show for HealthyLife.net and 60 syndication distribution platforms. The Railroad Pass Hotel & Casino is the oldest continuous casino in the United States! January 2015 kicks off on the first with a special encore presentation on Larry & Daena DO VEGAS!… and interview with Railroad Pass Museum Creator & Curator, Sean Holden. Railroad Pass Hotel & Casino holds one of the original gambling licenses in Nevada and is a “must-visit” historic hot spot for Las Vegas. On January 8th, Larry & Daena DO VEGAS! goes live on remote from the GOLD STRIKE Hotel & Gambling Hall in Jean, Nevada, just 20 minutes south of THE STRIP. 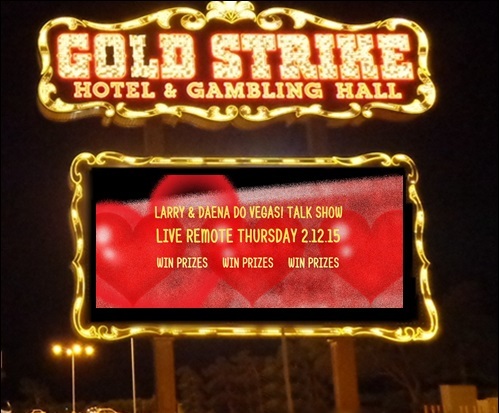 The GOLD STRIKE is a new Larry & Daena DO VEGAS! show sponsor and a fabulous oasis in the desert and ‘must-stop’ destination while traveling between Los Angeles and Las Vegas! Also on the 8th, Larry & Daena showcase an interview with Kurt Morgan, manager of the new VOODOO ZIPLINE atop the RIO Hotel and Casino. On January 15th, Ryan Bachik of REACT in Texas, shares with, Larry Montz and Daena Smoller and listeners, exciting news of amazing advancements in helping paralyzed patients regain various degrees of mobility. You won’t want to miss this very special Larry & Daena DO VEGAS! show! Stephanie Gregerson of ON MY WAY HOME RESCUE joins Larry Montz and Daena Smoller on Janury 22nd for a PETS IN A NEON PARADISE sponsored show on January 22nd. So give your pet an extra treat, tune in and find out what you can do to get involved in helping animals-in-need in Las Vegas and your city! What can we say about Vegas-born, Military-strong and artist / human ink canvas, Samantha Venerable? Well, it doesn’t matter what we say, it matters what SHE says… and she has a lot to say so don’t miss Samantha Venerable on Larry & Daena DO VEGAS! on January 29th! The Larry & Daena DO VEGAS! talk show is produced by VegasRadio.Today for HealthyLife.net All Positive Web Talk Radio and 60 syndicated distribution platforms that carry HealthyLife.net exclusive programming. Larry & Daena DO VEGAS! is LIVE each Thursday from ASTON MonteLago Village Resort at Lake Las Vegas and is sponsored by the GOLD STRIKE Hotel & Gambling Hall. PETS IN A NEON PARADISE is an online feature of VegasRadio.Today and sponsors a variety of Larry & Daena DO VEGAS! shows focused on spotlighting individuals and rescue organizations who help animals-in-need. Please support PETS IN A NEON PARADISE sponsors to produce these shows!